Heading into our 5th season, SummerStage at The Outfit (4-week session) has become our signature education program. 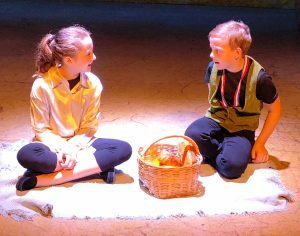 This month-long performance-based summer camp is designed for young actors (grades 5-11) who are serious about theater, but also looking for a summer filled with fun, friendship and performance skill-building in a nurturing environment. A typical day at SummerStage includes rehearsals for the musical, as well as classes in everything from costume design to special effects make-up to acting workshops which expose students to a variety of techniques. All Summer Stage classes, workshops and rehearsals are instructed and directed by Atlanta-area theater professionals who are experts in their artistic fields. All SummerStage participants (4-week session) are cast in a fully produced musical theatre production, which is staged with professional production values on the Theatrical Outfit stage. This year’s show is The Addams Family young@part, the smash-hit magnificently macabre musical comedy that brings the darkly delirious world of Gomez, Morticia, Uncle Fester, Grandma, Wednesday, Pugsley and, of course, Lurch to spooky and spectacular life. A $150 non-refundable registration fee (which goes toward the total cost of your SummerStage session) is required in order to reserve your spot for SummerStage. Full payment is due 1-week prior to the start of camp. Need-based scholarships are available. Scholarships are awarded in the order that applications are received. For best opportunity, please apply early. This 2-week session culminates with an original musical revue featuring scenes, songs, and choreography from popular Broadway musicals! This year’s show You’ve Got A Friend In Me, incorporates material from theater, film and popular culture, all around the theme of friends and friendship. Featuring songs such as “Friend Like Me (Aladdin), “For Good” (Wicked) and of course “You’ve Got A Friend in Me” (Toy Story), this theatrical montage will explore new friends, old friends, loyal friends and wacky friends in a joy-filled production! Students will also take part in a variety of workshops focused on multiple aspects of theater-making, including set design, makeup, and costume creation, in addition to receiving training in acting techniques and character development. * professionally-led sessions in costume, set, and props design, acting, improv and audition techniques, choreography, vocal training and more!